This week is Dining Rooms! 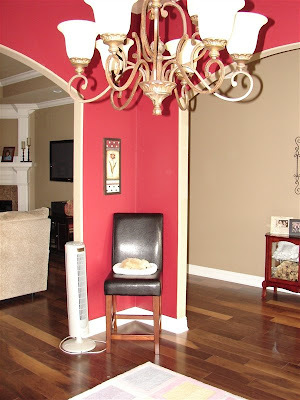 We do have a "formal" dining room -- but it is not being used as that. Currently, it really isn't getting used much at all. We recently moved the pod chair and rug into there for lack of a better place for them. 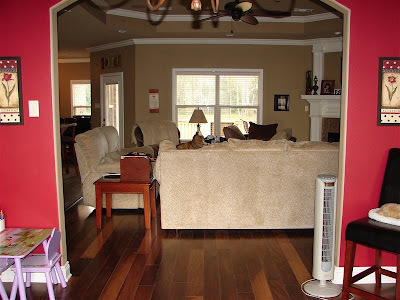 Once we got them in there, it kind of made the room a little more cozy and more of a "sitting room" feel. We have tossed around the idea of instead of spending a lot of money on a dining room table and hutch, maybe we could take that money and get a nice (slightly used) baby grand piano?? We're not seriously looking or anything - we're just not "formal" people. We're trying to think of other uses we could use the room for. I would love for my girls to take piano lessons -- and to do that, we would need a piano!! Oh well, here are the photos of the room. Enjoy - and I would love any other ideas as to what we could do! Here is a view into the dining room from our family room. 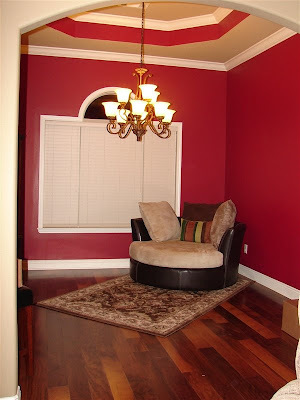 I love the red, it is called Stolen Kiss from Sherwin Williams. 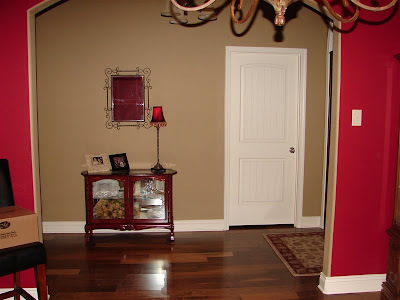 Here is a shot from the far wall of the dining room looking back at the entryway into our house. And a shot from one of the corners, looking at the other corner. You can see part of each of the archways that lead into/out of the dining room. Ignore the fan and the rug, this photo was actually taken this past fall for this post. At that time, the dining room was temporarily my girl's playroom. And here is a shot from the window, looking into the family room. Yeah, this photo was from last fall too. You can tell since the couch isn't under the far window like in my post on family rooms. In addition to my red walls, I love my chandelier. My husband doesn't so much because he has rammed his head into it many times. He is ready to raise it up some since we don't have much of anything in there right now. There you have it! I hope you enjoyed this week's tour and I hope to see you back next week. Have a great Memorial Day Weekend and be safe! I love the wall color and the ceiling. I love the paint in there! Love the 3 colors, it looks beautiful! Have you thought about an upright piano? It costs a lot less, takes up less space, and you could use the rest of the room as a craft area perhaps. Just a thought! A baby grand piano would be lovely in that space! 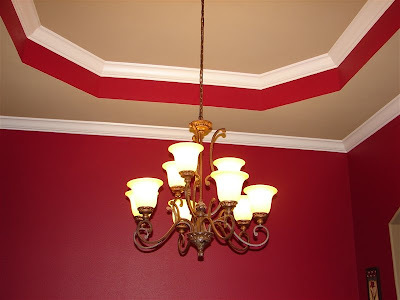 I love your red walls and ceiling! LOVE the colors on the wall and the chandelier! thanks for sharing! Wow, I love the ceiling! I vote for the baby grand. I love your colors and the ceiling. Usually those chandeliers can be raised some. We raised ours in our last house.